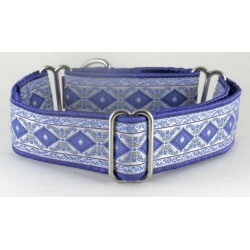 Burberrty Style martingale or snap-relase buckle dog collar. Neutral tones and a designer flair add to the charm of this handsome plaid. 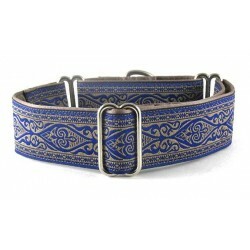 Leland Royal Blue martingale or snap-buckle dog collar featuring a dramatic Celtic design in contrasting shades of rich blue and taupe/brown. Celtic Hounds Green martingale or snap-buckle dog collar featuring a fabled Celtic Hound design in shades of green with grey accents. 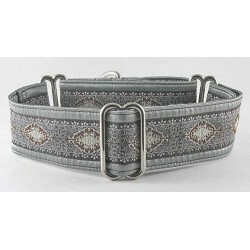 Silverbridge martingale or snap-buckle dog collar adorned with a Renaissance inspired silver/brown scroll and gate design. 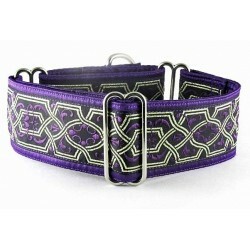 Flower Power a martingale or snap-release buckle dog collar blooming with colorful flowers on a black background. Azure Latimer a martingale or snap-release buckle dog collar adorned with enchanting, swirling shapes of gold, turquoise/aqua and black. 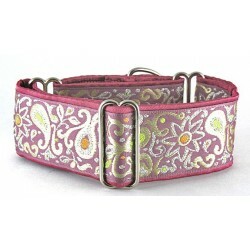 Coming Up Daisies Pink martingale or snap-buckle dog collar featuring a bright and cheery Daisy print. 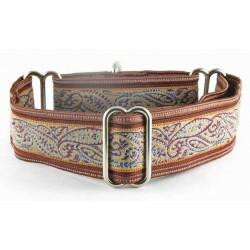 Burgundy Blues martingale or snap-relase buckle dog collar featuring a harmonius floral pattern in shades of wine and rich blue. 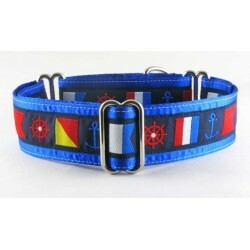 Aye Aye, Captain martingale or snap-buckle dog collar decked out with a jaunty, nautical trim including anchors and flags. 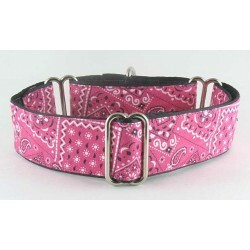 Pink Bandana martingale or snap-buckle dog collar. A timeless, traditional look for those casual days. 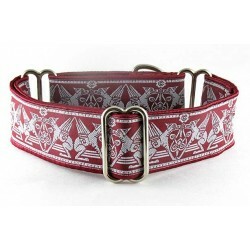 Celtic Hounds Burgundy martingale or snap-buckle dog collar featuring a fabled Celtic Hound design in shades of burgundy and grey accents. 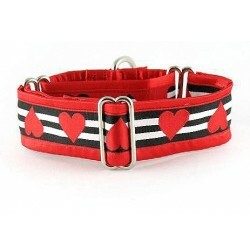 Hearts Afire dynamic martingale or snap-relase buckle style dog collar with a Red, White and black valentine pattern. 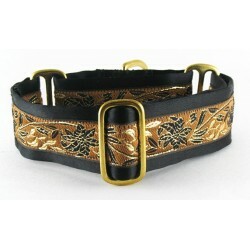 Sunday Mocha floral martingale or snap-relase buckle dog collar in earthy tones with a touch of gold. 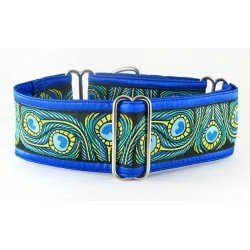 Peacock Pageantry martingale or snap-buckle dog collar displaying an incredibly beautiful, custom, woven Peacock trim. 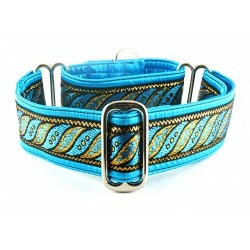 Barley Corn Sky martingale or snap-buckle dog collar adorned with a swirly, paisley pattern in shades of copper, wheat, and sky blue. 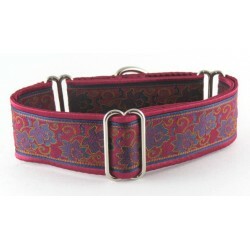 Madeliene Pourpre martingale or snap-buckle dog collar. The linear triangle is center-stage and surrounded by lush scrolling work and oringinal pattern design. 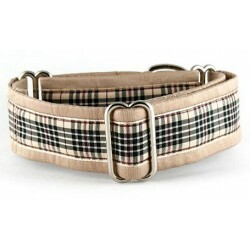 Gilby Lane martingale or snap-relase buckle dog collar wearing a handsome tartan ribbon in shades of brown, black and burgundy. 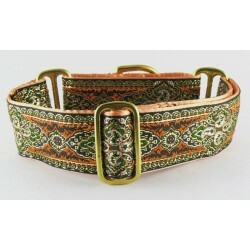 Masquerade martingale or snap-buckle dog collar embellished with a fancy woven trim in autumn colors. 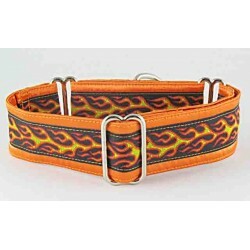 Too Hot to Handle Flames martingale or snap-buckle dog collar with a red-hot flame design on black. 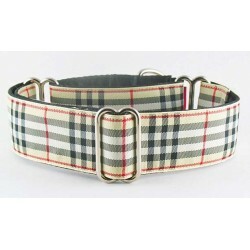 Tremayne martingale or snap-buckle dog collar. Gold Metallic threads are woven together to create a gated structure on this commanding collar. 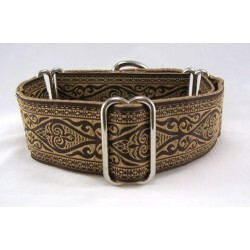 Leland Toast martingale or snap-relase buckle dog collar featuring a dramatic Celtic design wearing appealing tones of brown and fawn. 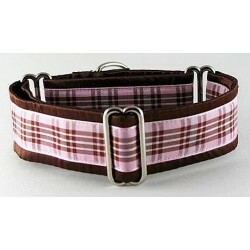 Malt Shop Pink martingale or snap-relase buckle dog collar attired in a sporty pink and brown plaid. 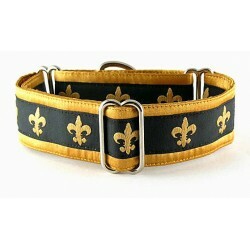 Gold Fleur martingale or snap-relase buckle dog collar featuring a woven gold fleur des lis on black trim.